Registration is available only through the CEDIA EXPO site. 32% of U.S. broadband households (with 3,000+ sq. ft.) own an average of 2.5 smart home devices, while the average U.S. household owns less than two. This interactive panel discussion will highlight adoption of high-end home entertainment systems and the home controls market, as it relates directly to custom installers. 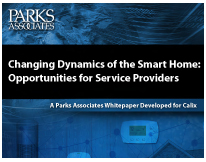 The session will feature insights on the state of the connected home, as well as channel competition from manufacturers and mass market solutions from telecom, cable, security and retail channels. Two-thirds of U.S. broadband households use a streaming audio service: 40% use a free service to stream audio, while 26% subscribe to a paid streaming audio service. This interactive session will address growth trends such as streaming audio, high-resolution audio, whole-home audio, and wireless technologies. The future outlook for key audio devices will be explored, including headphones, sound bars, speakers, home theater audio, and multiroom audio systems.